Ask Amy: How Do I Come Back to Ballet After a Difficult Illness? Is Your Instagram Habit Harming Your Technique? You spend countless hours in fifth position. But there's another position you might be just as familiar with: neck craned down, shoulders hunched and eyes on your phone. Researchers estimate that the average person spends two to four hours per day on smart devices, and this slumped posture can place up to 60 pounds of pressure on your spine. Oregon Ballet Theatre's Kelsie Nobriga and Matthew Pawlicki-Sinclair rehearse Bournonville's Napoli. Yu Yin, Courtesy OBT. Kelsie Nobriga's first run-through of Nacho Duato's Rassemblement was a wake-up call. Until then, the Oregon Ballet Theatre soloist had only rehearsed individual sections of the ballet, unaware that she'd have little time to recover in between each one. Discovering just how tiring the 27-minute ballet would be was terrifying. "The first time we ran it I felt like I was going to pass out or throw up," she recalls. "My quads would just give out. I was really nervous about how I was going to perform it onstage." When you're gasping for breath, not only do the simplest steps feel impossible, but your risk of injury also increases. Stamina is a crucial part of a dancer's performance tool kit, though typical ballet classes don't do much to develop it. With some advance planning outside the studio, you can build up your cardiovascular and muscular endurance to make a marathon ballet less daunting. Ask Amy: I Break My Pointe Shoes In Too Quickly. What Should I Do? We get it: Ballet is exhausting, and sometimes all you want to do during a quick break between rehearsals is, well, nothing. Bill Evans, director of the Evans Somatic Dance Institute, recommends the following options, which are both relaxing and recuperative for the stresses dance puts on your body. From energizing restorative poses to deep breathing, here are five ways to make your downtime work for you. If you're about to learn a tough ballet, cross-training ahead of your rehearsal period can help you gain the extra stamina you need. Repeated short spurts of high- and moderate-intensity exercise most closely replicate the pacing of a pas de deux, variation and coda, or the "push" and "rest" sections of an ensemble piece. Kester Cotton, dance program coordinator at Spaulding Rehabilitation Network in Boston, explains how to use both interval training and steady-state endurance workouts to build the stamina that you don't get in class. This can be done on an elliptical machine, a bike or an Arc Trainer. (Be sure to clear participation in a cardio program with your physician before getting started). 1. Determine your maximum heart rate by subtracting your age from 220. Then calculate your "training zone," which is between 70–85 percent of your max. Cotton strongly recommends using a heart rate monitor or fitness tracking device to accurately measure how hard you're working (and prevent overdoing it). 2. Aim for 2–3 steady-state endurance workouts per week with your heart rate at 70–80 percent of your max for approximately 30–45 minutes. 10-minute warmup, gradually getting to 70 percent heart rate. Challenging but not hard effort for 1 minute, followed by 30 seconds of easier effort. Repeat 5 times. Hard effort for 40 seconds, 20 seconds easier. Repeat 10 times. Very hard effort (upwards of 80 percent of your max heart rate) for 20 seconds, 10 seconds easier. Repeat 10 times. Xiomara Reyes, head of The Washington School of Ballet, describes grand battement as "a very important base step that helps with flexibility, jumps and stability. It's the beginning of a grand jeté, the farthest push of your body in space and movement." Here, she shares how she works on this essential building-block step. An injury can feel like a complete backslide, but that doesn't mean you have nothing to gain while you're on the sidelines. According to researchers from St. Mary's University, talking out your emotions after getting hurt can make it easier to move past the negative and come back stronger. Stella Abrera in Romeo and Juliet. John Grigaitis, Courtesy ABT. 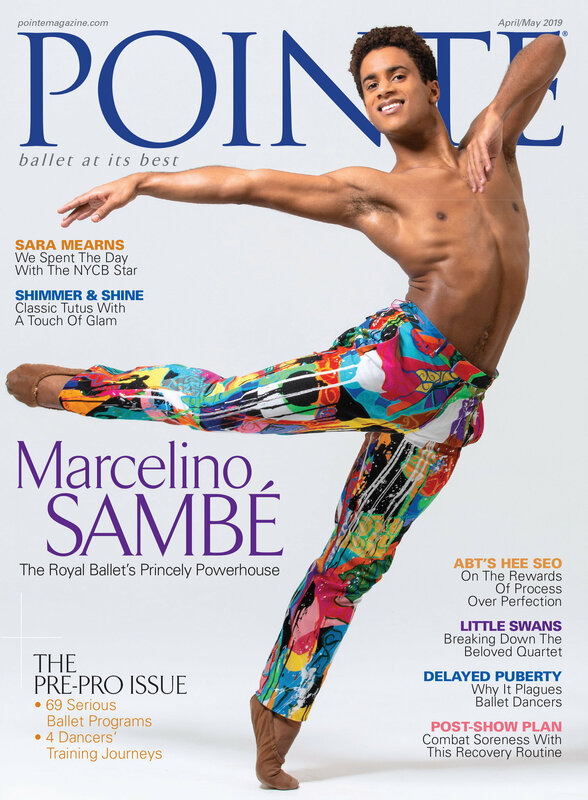 This American Ballet Theatre principal has jump training down to a science. Abrera in Harlequinade. Erin Baiano, Courtesy ABT. Abrera with James Whiteside in Jessica Lang's Her Notes. Rosalie O'Connor, Courtesy ABT. Abrera in Whipped Cream. Gene Schiavone, Courtesy ABT. All photos by Kyle Froman for Pointe, modeled by Gwen Vandenhoeck of Ballet Academy East. This simple exercise isolates turnout from the hips, says the Harkness Center for Dance Injuries' Emily Sandow. Lie on your back with legs in the air and feet flexed. Rotate from parallel into first position and back again, seeing how the upper leg rotates and the feet follow. Feel the muscles at the backs of your legs—where the elastic of your leotard's leg seam is—and your inner thighs engaging to make the rotation happen. Notice how you can turn out without using your bigger gluteal muscles. Physical therapist Lisa Apple recommends doing this common exercise against a wall to prevent tipping the pelvis backwards or forwards. Lie on your side with your back and feet flat against a wall, both knees bent and the legs stacked. Open your top knee as far as you can. Hold this position before slowly bringing your knee down. Repeat until the point of fatigue and switch sides. Still lying with your back against a wall, bend your bottom leg with your foot flat against the wall and straighten your top leg. Turn out the top leg and lift it slightly (like a small dégagé), keeping it firmly pressed against the wall. Progressively lift your leg an inch or two higher at a time, holding at each level for 1–2 seconds. Go as high as you can go without losing contact with the wall. Lower slowly with control, maintaining the turnout you achieved on the way up. "Holding your placement against the wall going both up and down is key for pelvic alignment," says Apple. Start with 6 reps per side, aiming for quality over quantity. To reproduce this feeling standing, Apple recommends standing in parallel with a paper plate under each foot (or rotation discs if you have them) and rotating to first using the same muscles. Spending hours each day in turnout causes the external rotators to shorten, tighten and work less effectively, Sandow says. To maximize your potential turnout, balance stretches (like the figure four stretch and pigeon pose above) with strength work and spend time not turned out. "If you're taking class and rehearsing all day, walking turned out just leads to chronic overuse of those muscles," she says. "Plus, you're unnecessarily stressing the ankle ligaments and tendons." Try something as simple as walking in parallel. Turnout 101: Where Does It Come From, And How Can You Get More? International performer Joy Womack balances flexibility and strength to maintain her turnout. Photo by Quinn Wharton for Pointe. Turnout is one of the defining characteristics of classical ballet and the foundation of your technique, but the deceptively simple concept of external rotation can be hard to execute. For those born with hip joints that don't naturally make a tight fifth position, it's tempting to take shortcuts in the quest for more rotation, but you'll end up with weaker technique and a higher risk of injury. We asked top teachers and physical therapists to break down the meaning of turnout and offer safe ways to maximize your range. Where Does It Come from Anatomically? Xiomara Reyes describes turnout as "a rose blooming from the inside out." Photo by media4artists/Theo Kossenas, Courtesy The Washington School of Ballet.